Dr Chinmayee Pradhan is an Obstetrician & Gynaecologist with an experience of 12 years in this field. 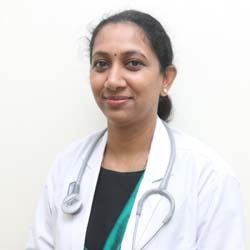 Dr Chinmayee Pradhan practices at Apollo Cradle in Jubilee Hills, Hyderabad. She completed MBBS from Gandhi Medical College, Hyderabad in 2001, DGO from Kakatiya Medical College, Warangal in 2004 and DNB in 2008. She is a member in Federation of Obstetric and Gynaecological Societies of India (FOGSI). Some of the Interests: High Risk Pregnancies, Antenatal Care, Infertility, Gynaec Problems, Laproscopy, Contraception. Apollo Cradle had made our dream come true. I delivered my baby there very safely. There was no risk and I felt I was in safer hands. I was under the care of Dr. Chinmayee Pradhan who was always there for us when we had concerns or queries and her best attitude is clearly visible. Special thanks to room keeping staff and food service staff. Mrs.Srilatha – Jubilee Hills, Hyderabad. For my delivery, I was admitted to Apollo Cradle in Jubilee Hills. Dr Chinmayee Pradhan is an amazing doctor. She, along with her team did a great job. The nurses are always cheerful and ready to help. The discharge formalities were done swiftly, and the front office staff had good communication skills. The room was nice; however, the food could have been better. Mrs.Vinisha – Jubilee Hills, Hyderabad. My relative referred Apollo Cradle to me for my delivery. My gynae, Dr Chinmayee Pradhan was simply superb. Her superior knowledge and expertise made sure I had a safe and stress-free delivery. A big thank you to the wonderful nurses and the housekeeping team for doing such a great job. I opted for a suite and it came with a lot of amenities such as TV, mini fridge, AC, storage closet, etc.